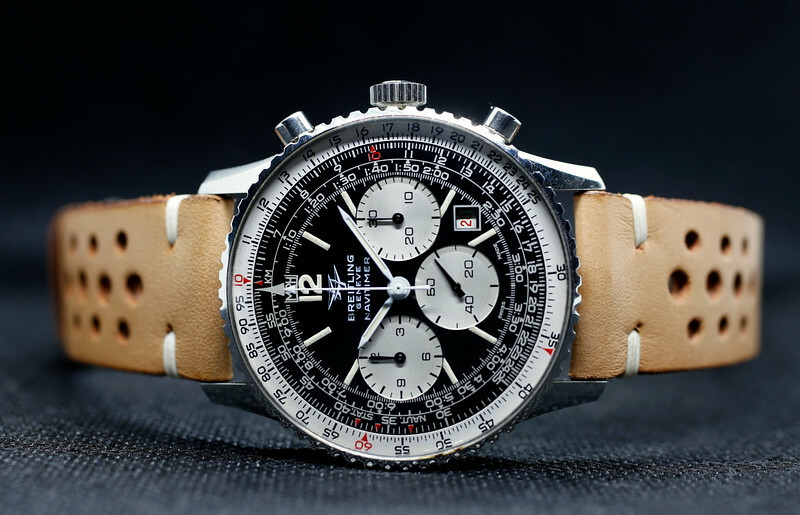 Launched in the early 1950s, the Navitimer was designed with a very specific demographic in mind: pilots. The many scales on the dial allow the wearer to perform essential calculations while in the air. Like most tool watches, it wears big in order to allow for good legibility. The later reference 7806 was the first Navitimer to feature a date function near 5 o’clock with a red date disc with a manual wound Valjoux 7740 movement (instead of the usual in-house Venus 178 found earlier Navitimers). This is the direct successor to the 806 with a date window and one of the last manual wind Navitimers. Black dial with large silver subdials (“big eyes”). Tritium dial is in excellent condition with beautiful, lightly aged lume on markers and hands (one of the best you will see in the market). The luminous material on the dial and hands are original to the watch, slide rule rotating bezel, acrylic crystal, circa 1972. Wonderful wrist presence with a classic 1960s vintage look.  Signed case back (7808) unpolished.  Rotating inner Slide Rule bezel.  Movement: Valjoux 7740 calibre mechanical manual winding.  Dial: Black glossy dial with silvery white sub dials and creamy patina Tritium markers. No visible flaws. White tritium hands.  Strap/Bracelet: high quality, vintage-style rally strap and steel pin buckle. Considering its age, the watch is in mint condition and original and unpolished. The dial and hands match and have great patina with minimal degradation. The signed manual winding movement, Valjoux 7740, is working perfectly (all functions). Strong spring tension indicates it was recently replaced/serviced. A legend of watch making history and an ideal investment piece increasing in value year on year particularly in this condition. For many aficionados this marked the end of the true (manual winding) Navitimer. PRICE: USD 5,900 (shipped express worldwide).